As with the original, the little ladybird features on every page so you can turn trying to spot her in to a fun game! If you already have ‘What The Ladybird Heard‘ then this is a fun addition to your collection as it features a host of characters which will already be familiar to your child. Equally, it a great format with which to introduce the book to slightly younger children, who may not yet be ready for the full picture book. 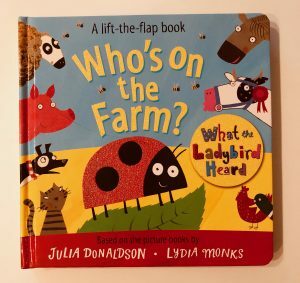 Tagged as Animals Farm Farm Animals Interactive Books Julia Donaldson Lift The Flap Lydia Monks Macmillan Children's Books Reviews What The Ladybird Heard Who's On The Farm?